It happens all too often, you end up on a website and can’t figure out what you should click on next. This is caused by poor web design, and a lack of prominent and concise call-to-actions. You may be guilty of this too on your website, which is why we’re going to go over the do’s and don’ts of call-to-actions. If you’ve noticed that your bounce rate is higher than you’re comfortable with, then a lack of good call-to-actions may be the cause. Don’t focus on the action of “clicking”. Links and buttons that say “Click here to learn more!” should be 100%, without a doubt, avoided. By saying “Click here”, you cause the user to focus on the action of clicking, rather than the actual goal of the button, which is to “Learn More”. Another issue with “click here” CTAs? Mobile. Your visitors on tablets and smartphones aren’t “clicking”, but touching and tapping. Design your CTAs to stand out. Choose a color that goes with your website, but not necessarily one you’re already using. This color can be used for your primary CTA buttons, and will help differentiate primary CTAs from secondary CTAs. It also helps if this color has enough contrast from whatever the button is sitting on. 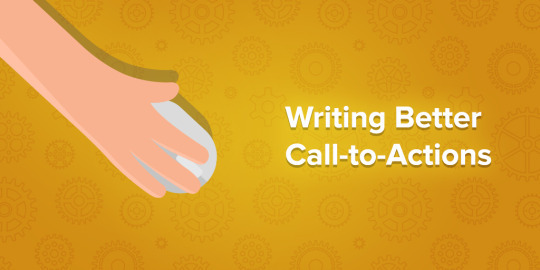 A call-to-action is more than just a button. The content surrounding your CTA is just as important as your buttons and links. Your visitors are less likely to read whole paragraphs, compared to concise titles and subtitles. 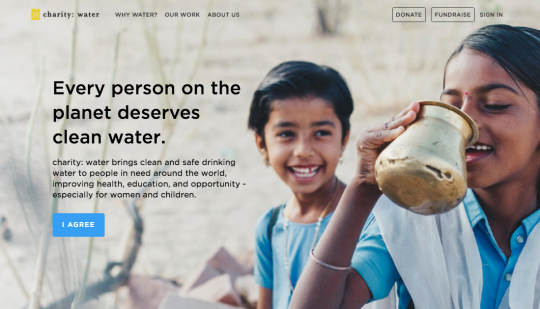 Not only does Charity:Water have a beautiful website, but their call-to-actions are unique and fitting for their mission. On their homepage, they start with a short statement that’s to the point: “Every person on the planet deserves clean water.” This is followed by a slightly longer description to give the CTA some context, and finally a simple “I Agree” button. This is a great example of a CTA that doesn’t answer the typical “I want to…” question, but still engages visitors in a unique way. An industry leader in email marketing tools, MailChimp knows how to design a good CTA. Right out of the gate they’re telling you what they do, “Build your brand. Sell more stuff.” this is followed by a “Sign Up Free” button. MailChimp totally nailed this CTA, their primary button is concise and answers a visitor’s “I want to…” question. Being of the largest mortgage lenders in the nation, guaranteedRate has had years of CRO experience. Their latest website is a clear example of this, since their CTAs are on point. One interesting thing about this site is how they have 2 buttons with different funnels. One directs to to a loan application to get started, while another walks you through a loan option wizard. Right away on Campaign Monitor’s website, you’ll notice the giant green button. This has great contrast with their video background and draws your eye to the “Get Started For Free” action. One of the things we love about Basecamp’s homepage is how their CTA includes an email collection field. The offer is clear and concise, “Try it free for 30 days”. The email field allows them to nurture incomplete signups with an email sales funnel. PixieSet is a favorite amongst photographers when it comes to client galleries. 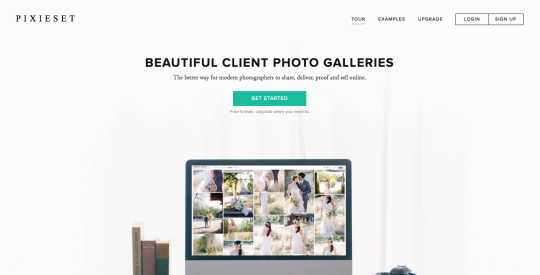 Their homepage features a bold and to the point headline: “Beautiful Client Photo Galleries”. We’re off to a great start, no question about what they’re offering. We follow that up with a big, green, and contrast-y “Get Started” button. 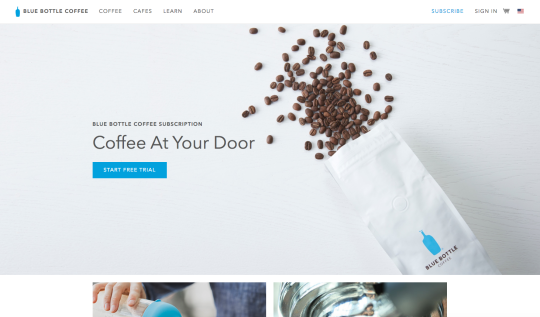 Naturally, Blue Bottle Coffee has a seriously good website to go with their seriously good coffee. Their homepage touts a clean design with a no-frills CTA. What do we want? Coffee at our door. How do we get it? By starting our free trial. 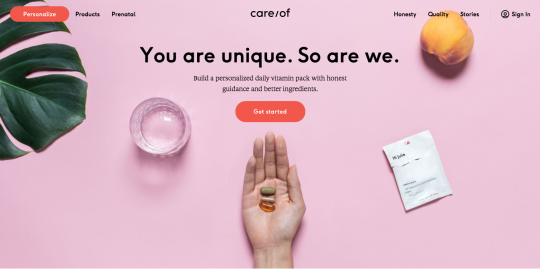 Care/of may be experts when it comes to personalized vitamins and supplements, but they also know a thing or two about conversion optimization. Their “Get started” button takes you straight to their personalization wizard. This CTA features gorgeous imagery and a concise description of what Care/of offers. Call-to-actions can make or break your website, and are especially important if you’re paying to drive traffic. 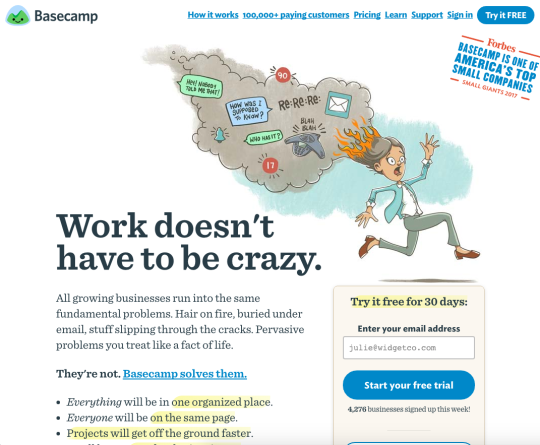 Hopefully, some of these examples can help inspire you to revamp your call-to-actions and improve your conversion rates.